Nagas are known to be very adventurous in food habit. There is no denying. It is also commonly known that Nagas love pork. 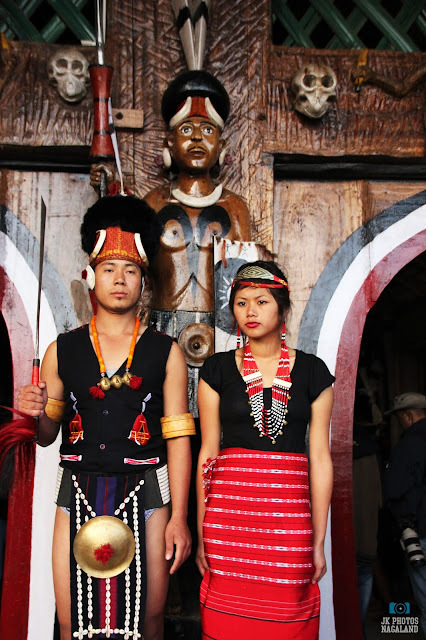 In fact, no weddings and events pass by in Nagaland without pork on the menu. Besides pork, other common meat sources in Nagaland are beef, chicken and fishes. But, that's the regular stuff almost everywhere. Boring. Right? By the way, Nagas also love their veggies and they mostly have them raw or boiled. Yes, just plain boiled with salt and sometimes with some local spices. Naga families also would normally have a kitchen garden from where some fresh veggies can get to their plates. Like most people around the world, and for most Nagas too, the most common sources of meat are - pork, beef, fish, chicken and mutton. This may be noted, as it is not usual nor affordable to get exotic stuff on the dinner table very often. So, if you are thinking that Nagas have dog meat or exotic insect dishes every day, you are wrong. But it's true that besides the usual stuff, for those who can afford and have access to, Nagas have a lot more varieties on their plates. 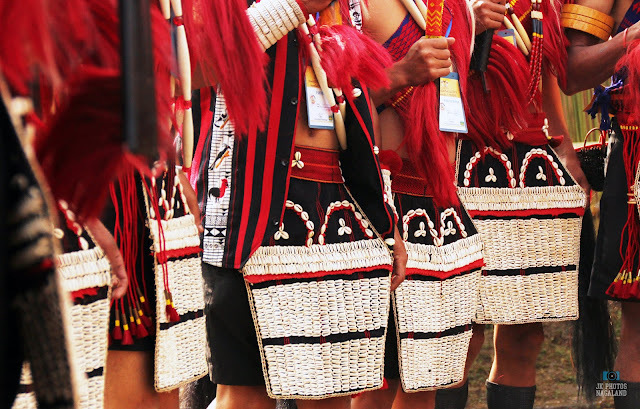 Most delicacies enjoyed here in Nagaland may be bizarre to many. To some who have tried and maybe liked some, they may be a delicacy. 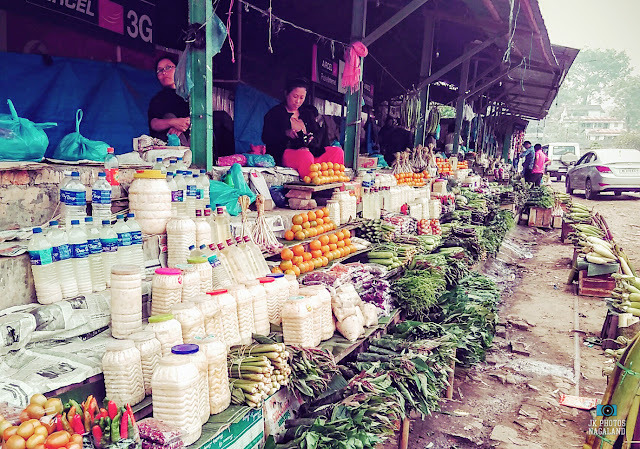 Nevertheless, food habits around the world are diverse, not only in Nagaland. It is a personal taste and a subjective matter- hence, keep one's opinion to oneself, and let's not be judgemental (laughs). If you can do that, let's explore some Naga food items. 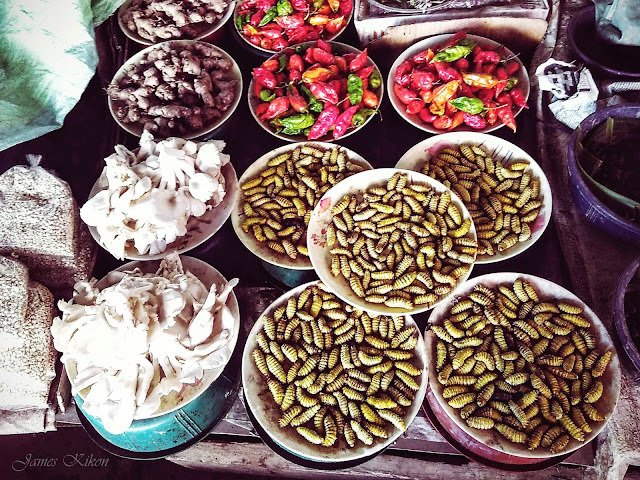 Some Naga food items one would normally see at local markets in Nagaland. Nagas love hot chillies. We have commonly heard Westerners say Indian food is very spicy. On the other hand, even Indians find Naga food spicier! Nagas love hot and spicy food. Besides the regular chillies, the "Raja Mircha",as it is locally called is, is one special chilli. 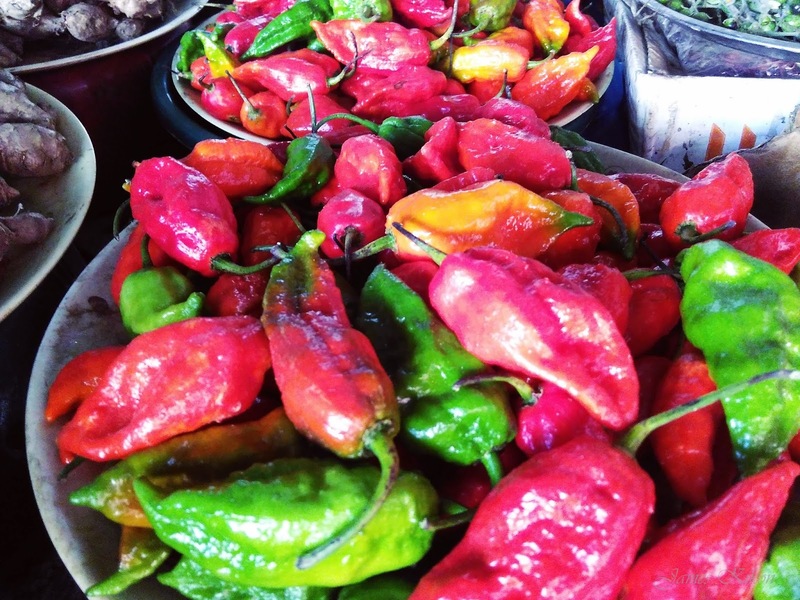 It is one of the hottest chilies in the world. Nagas love the "Raja Chilli". These hot chillies are had raw, in chutneys and curries. In 2007, Guinness World Records certified that the ghost pepper was the world's hottest chili pepper, 400 times hotter than Tabasco sauce. The ghost chili is rated at more than 1 million Scoville heat units (SHUs). However, the ghost chili was shortly superseded by the Infinity chili in 2011, followed by the Naga Viper, the Trinidad moruga scorpion in 2012, and the Carolina Reaper on August 7, 2013. - Wikipedia. 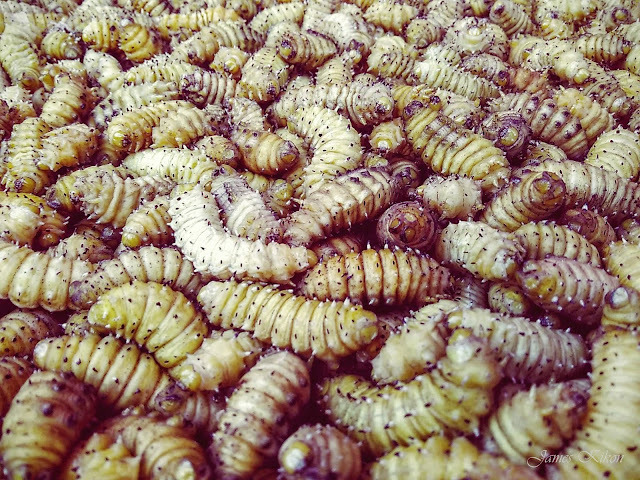 Roasted or fried or cooked in bamboo shoot vinegar, these wood worms are fatty! These worms are found in wood. 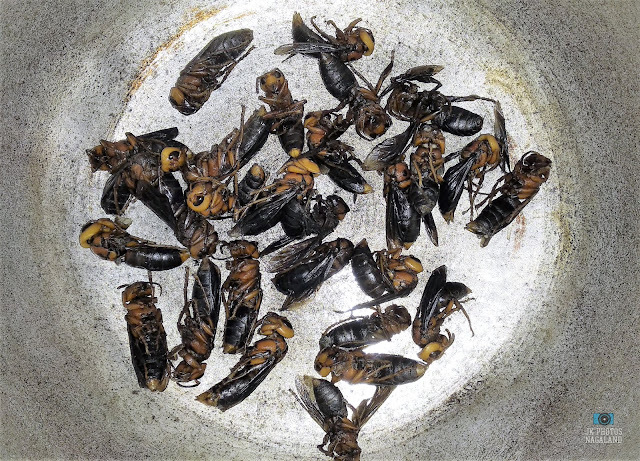 If you have seen Barry Giles on "Man vs Wild" chewing on some crawling creature, these Hornet Larvae would be nothing extraordinary. 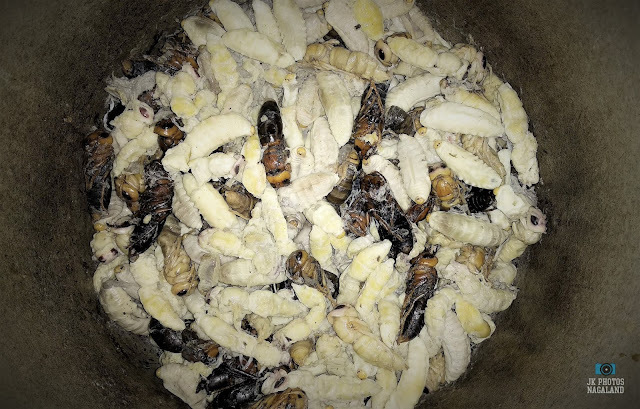 These Hornet Larvae are usually cooked in fermented bamboo shoot juice (bamboo vinegar), water and some chilies. They are usually not sold by weight but per piece or in their sheath. The little larvae are damn expensive. Do Nagas enjoy these often? Nah...they are pretty expensive. 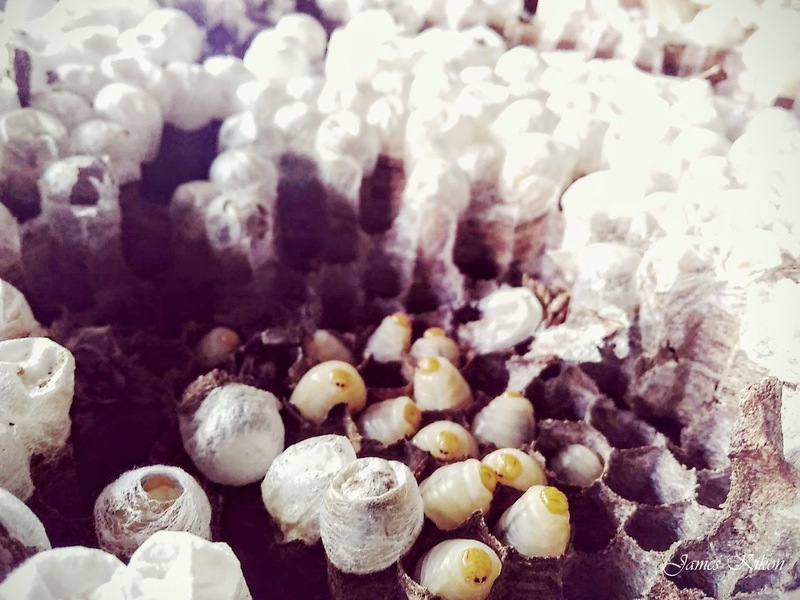 A sheath containing about 100 larvae would cost more than a thousand rupees. That's more than four kilos of pork meat! For some, the sight of these worms may be hair raising. But to some these are mouth watering. Strange what food habits do to us hmm? 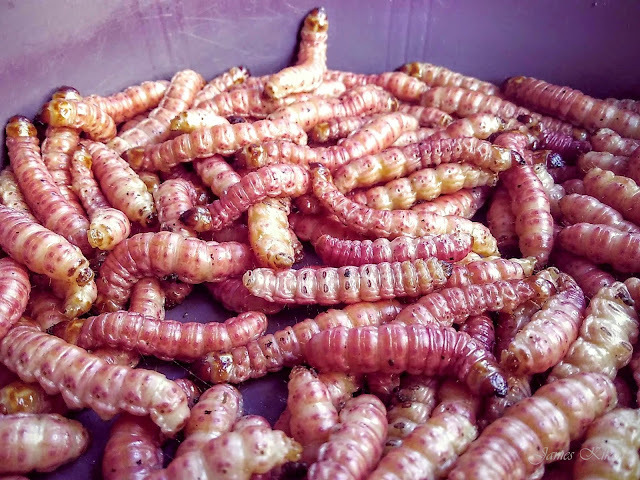 Anyways, these Wiggly Red Tree worms are usually eaten roasted or dry fried in a pan in oil or cooked in bamboo-shoot juice (bamboo vinegar). 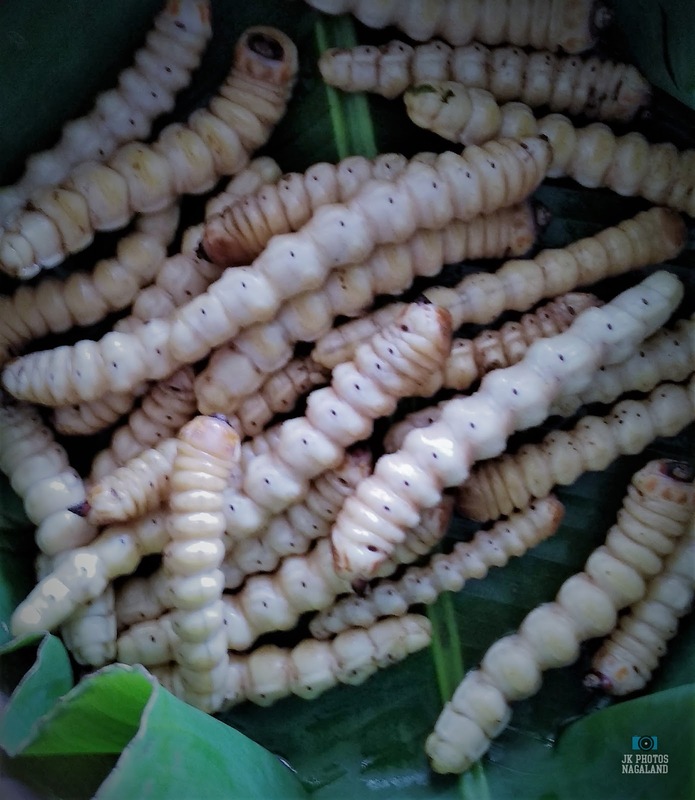 Silk Worms are reared for food in Nagaland rather than for it's silk. 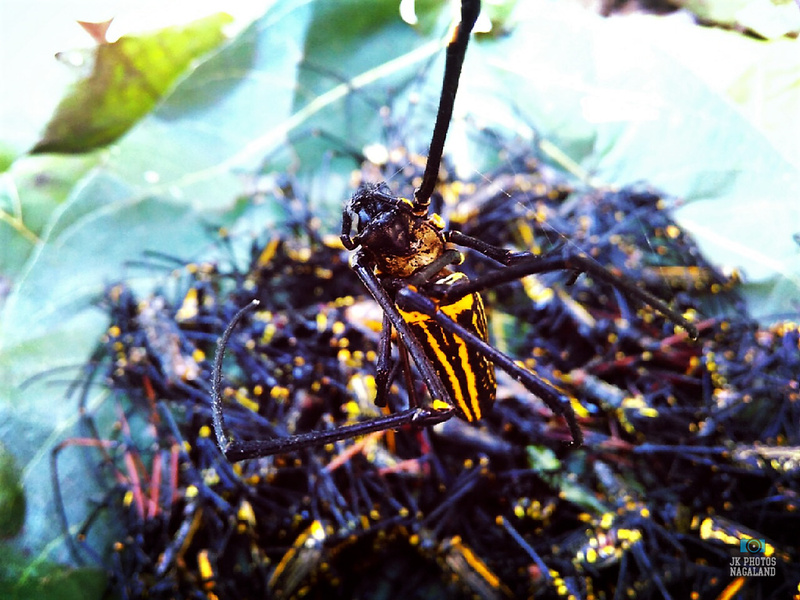 These yellow silk worms are taken out not long after they enter their cocoons. By that time, their intestines are clean. As usual, they are also usually cooked in bamboo shoot juice (bamboo vinegar) or fried in oil - crunchy. 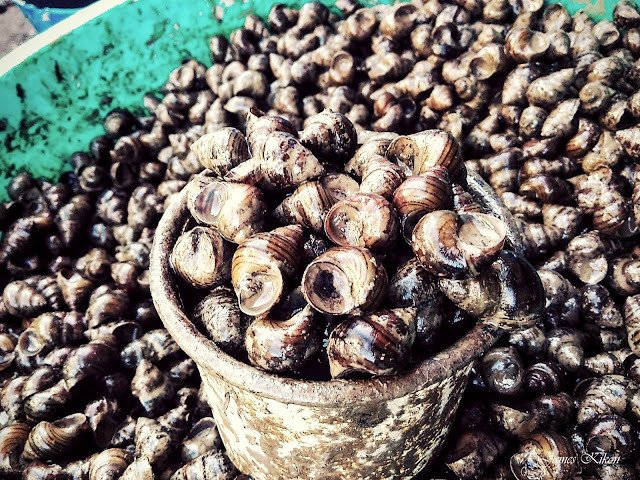 Snails, commonly from paddy fields, are also common food item in a Naga bazaar. They are usually cooked locally in smoked pork fat along with some chilies and garnishing. Once cooked, they are sucked out by mouth or picked using toothpicks. These snails are a bit "chewy" and tastes good. Snails are also commonly consumed in France and other European Countries. escargot - A dish, commonly associated with French cuisine, consisting of edible snails. 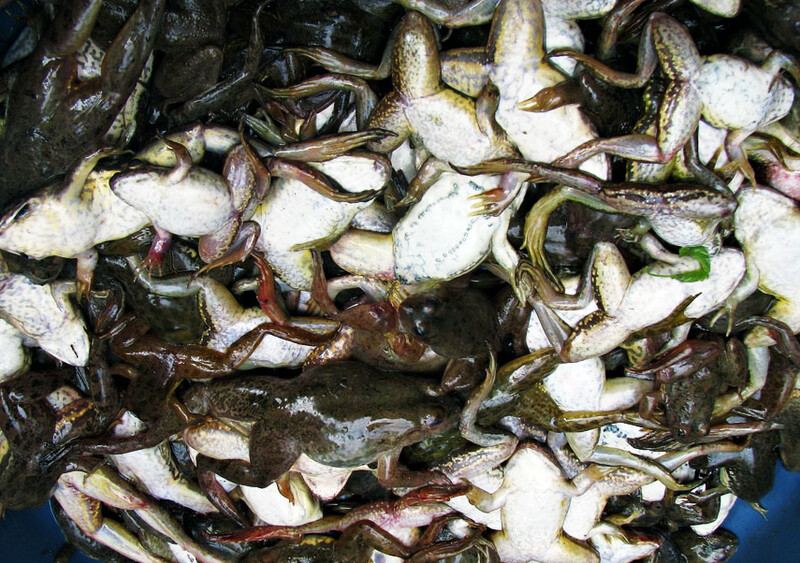 Frogs are another common Naga food item that one would see in a local bazaar. Frogs must be bizarre food item for many outsiders. But for Nagas, it's a delicacy and also apparently medicinal. Frog soup and meat is generally recommended to people treating wounds. Frog meat is used in delicacies of many countries around the world (Wikipedia Reference). So Nagas are not alone here (grins). 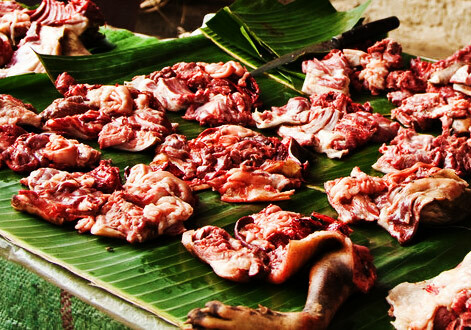 Dog meat is another common Naga food items sold in Naga Bazaars. Just like Frog meat, Nagas are not the only homo sapiens on earth to eat dog meat! Mind it! (Wikipedia Reference - dog meat is recorded to be consumed in many parts of the world including East Asia, West Africa, Europe, America, China,Korea and Vietnam). 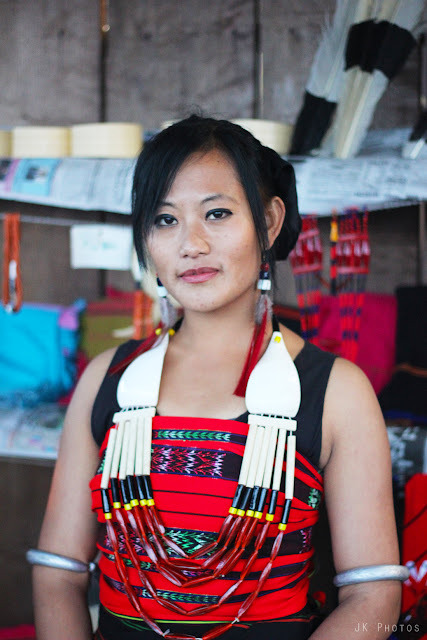 It may be pointed out that the population of Nagas eating dog meat may be considerably less. Especially the younger generation don't like to take dog meat. May be more and more people are keeping dogs as pets rather than rearing them for its meat. Some may find the idea of eating dog meat disgusting or taboo. Like any other food, it depends from culture to culture. In Nagaland, dog meat is considered medicinal, recommended to people with wounds and weakness etc. Crabs are eaten as food in many parts of the world - not bizarre at all eh? This photo of fresh water crabs taken at a village is cooked dry in bamboo shoot juice or bamboo vinegar. They are crispy and tasty. Well, who knew you could eat bamboos too! Nagas! Nagas love bambooshoot! They consume it fresh, fermented or dried. A fermented bambooshoot also produces an acidic juice somewhat like a vinegar. Fermented bamboo shoots sold in jars at a local vegetable market. Fermented bamboo shoots are used in many Naga cuisines and the juice is also used a local vinegar. Pork in bambooshoot is one such popular Naga cuisine using bambooshoot. Trust me. Edible ones only! If the food items listed so far a alright, spiders may be a level up! You would need a little bit more guts and will to chew them. And just when we were about to give Nagas credit for eating spiders too, a simple Google search tells us that spiders are eaten elsewhere too. 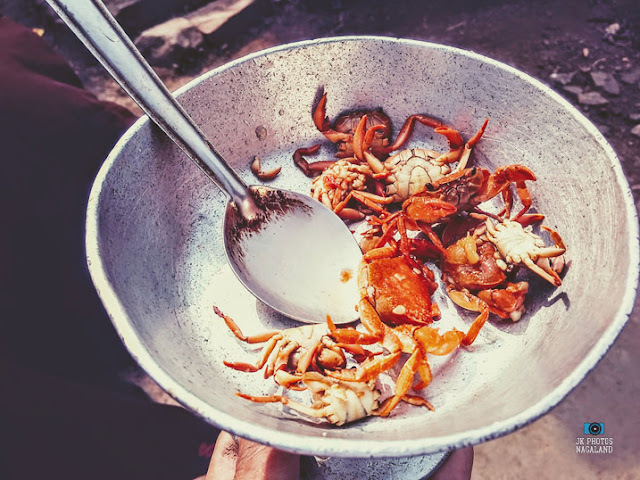 Fried Spiders are a delicacy in Combodia. Besides the above items, other food items that you would find in a Naga food market, some of which are seasonal includes - locusts, grasshoppers, wild rats, white rats, guinea pigs, snakes (some tribes do) etc. Lastly, remember that food habits varies from culture to culture. There is no need to be judgemental or to make fun of others who enjoy more variety of food. 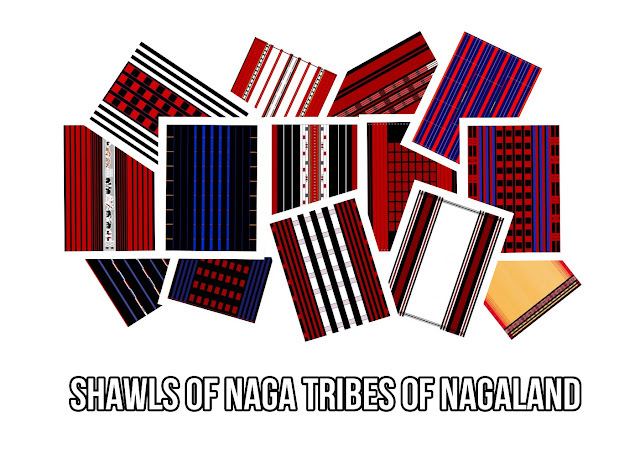 Have you been to Nagaland and tried any of these Naga food items? Comment. Do you try a different food which is generally not consumed in your culture? Comment.